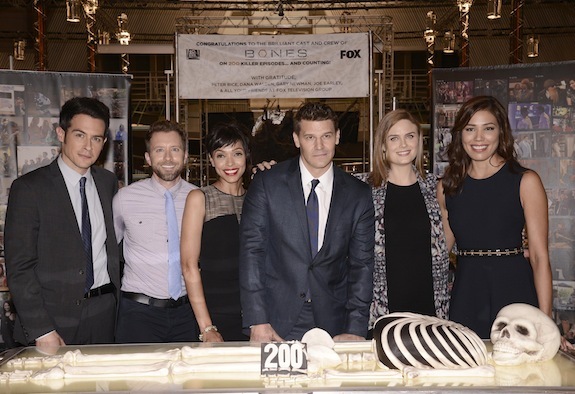 Give Me My Remote > Bones > BONES 200th Episode Celebration: Check Out Photos! BONES 200TH EPISODE CAKE CUTTING EVENT: L-R: Cast members: John Boyd, TJ Thyne, Tamara Taylor, David Boreanaz, Emily Deschanel and Michaela Conlin celebrate during the BONES 200TH EPISODE CAKE CUTTING EVENT on set in Los Angeles, Friday, Nov. 14th. Cr: Dan Steinberg/PictureGroup for FOX.